Diamonds are likely the most famous gemstone in the world. Few other gems have captured our imagination and sense of romance as diamonds. While everyone is familiar with traditional white diamonds, few understand that there’s an entire range of color found within these jewels. Rarely occurring in nature, red is the most unusual color to be found. Shop LC presents enhanced red diamonds, providing a unique opportunity to own one of these rare stones. Few will ever have the chance to see a red diamond in person. Is red diamond valuable? The value of colored stones is typically determined by a combination of its color, clarity, cut, and carat weight. This is no different when determining what red diamond’s worth. These guidelines will help you choose red diamonds for your collection. The most important characteristic in any fancy diamond is the main color a person will see. This is referred to as its face-up color. Many colored diamonds are often blended with other colors and muted by grayish or brownish tones. Enhanced red diamonds possess an even red hue, free of secondary color. It ranges from a medium to dark tone. These are rich, bloody reds, brimming with life! Red diamonds typically are visibly included. But in colored diamonds, especially in the red variety, color is a much more of a deciding factor in calculating the value as the intense hue of the gem often masks the inclusions. The majority of one to three-millimeter size gems undergo shaping as round stones. Less frequently, you’ll find them in fancy shapes such as trillion or baguette. Our sources provide stones that typically measure between one to three millimeters, ideal as melee in red diamond gemstone jewelry. Melee are diamonds under one-fifth of a carat, and very popular in contemporary jewelry design. 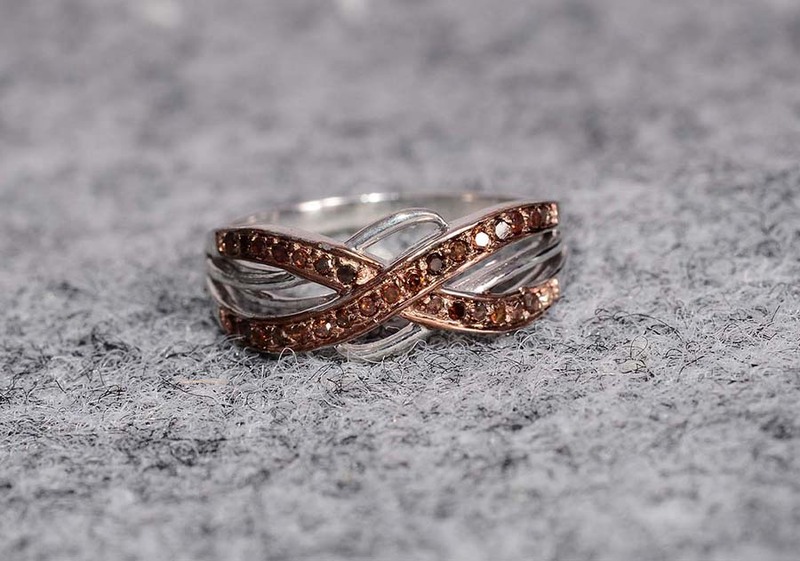 You’ll find them pave set to create large clusters of sparkling stones or channel set in rings for endless bands of color. Red diamonds from Shop LC undergo treatment to create their striking red color. First, finished stones are sourced through trusted outside vendor partners. 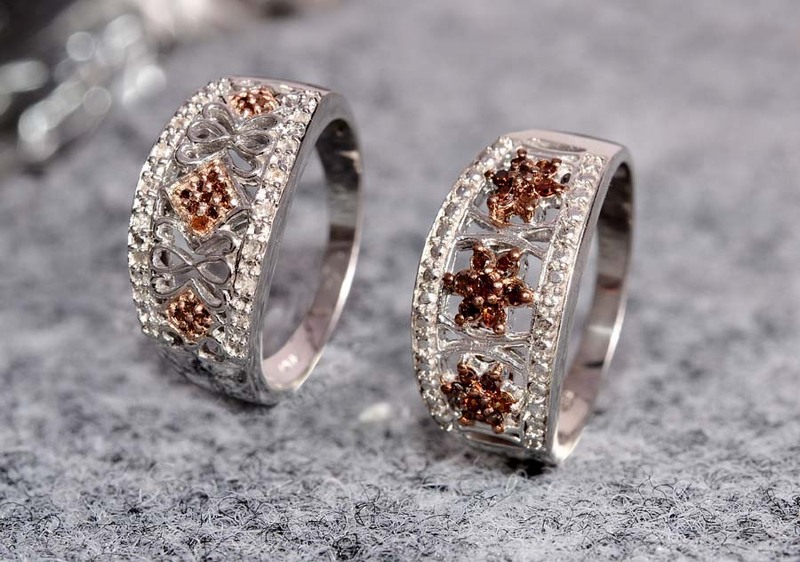 These are light brown diamonds that have already been cut and polished. As suitable stones are difficult to acquire through a single vendor, multiple small lots are bought to build a supply for a production run. The rough that these finished stones come from only have a 30-percent yield at best, meaning most of the raw material isn’t suitable for lapidary use. The majority of these diamonds are processed by exposure to irradiation. Rarely, stones may also undergo high pressure, high temperature (HPHT) treatment. Ultimately, this creates a stone of uniform red color after irradiation. No matter the process, this period takes nearly a month to finish. Processed stones must then undergo a second quality inspection. Now treated, the process may leave them undesirable for use in jewelry. 15 to 20-percent of material will be rejected at this stage. Acceptable stones are then sorted by color for use in jewelry. From start to finish, only about 25-percent of rough brown diamond ever becomes an enhanced red diamond. The treatment is stable and permanent, and stones can be further polished or set in jewelry as required. Diamonds are defined by their legendary toughness, and enhanced red diamonds are no exception. Ranking ten on the Mohs scale of hardness, diamonds are the definitive mineral for this level. Red diamonds are tough enough for daily wear but can still break or chip if struck hard enough. 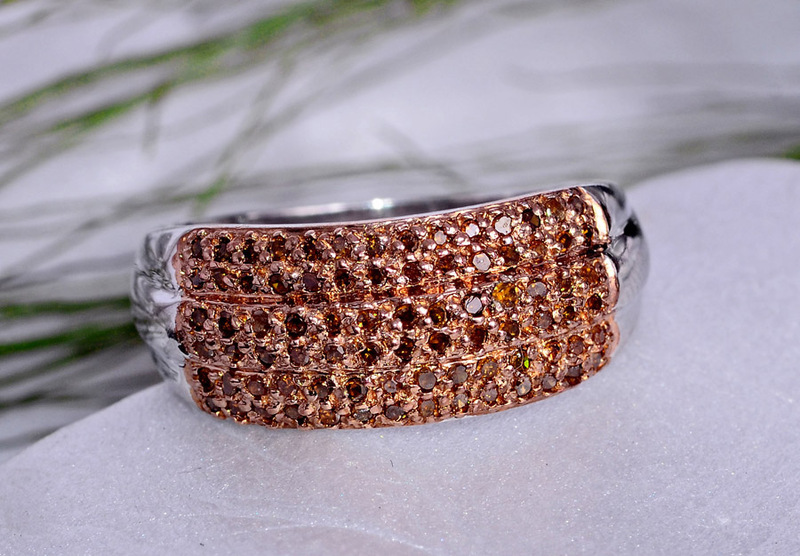 This stone withstands abrasions and scratches with ease, so it is suitable for all jewelry types. Red diamond can be safely cleaned with warm, soapy water and soft brush. A soft dry cloth is advisable to soak all the moisture. As the stone is treated make sure to keep this stone away from heat, chemicals, ultrasonic and steam cleaners. Store your gorgeous pieces separately from other jewelry to avoid unexpected scratches. Who Can Wear Red Diamond? Fancy colored diamonds, such as red diamonds, are ideal for those wanting a twist on this classic white jewel. Red is the color of passion, making a good stone for gifting romantic partners. It’s also a symbol of life and vitality, and one of the most prominent colors in humanity’s visual spectrum. Wear a red gemstone to set yourself apart from the crowd and demand attention. A red diamond ring makes an excellent substitute to the traditional diamond ring. Being red in color makes it an excellent wear with colors such as black, white, yellow, red and blue. How Does Red Diamond Compare to Other Red Gemstones? Red diamond is the rarest of the fancy diamonds. Being rarer than blue and pink varieties of diamonds increases its value many folds and makes it one of the most sought-after gem. Red diamond color is rarer and more unrestrained than other red gemstones. Consider the gorgeous red diamond if you love the appeal of Mozambique garnet, Niassa ruby, coral and red jade. Where Does Red Diamond Come From? Diamonds are found in locations throughout the world, especially Africa. 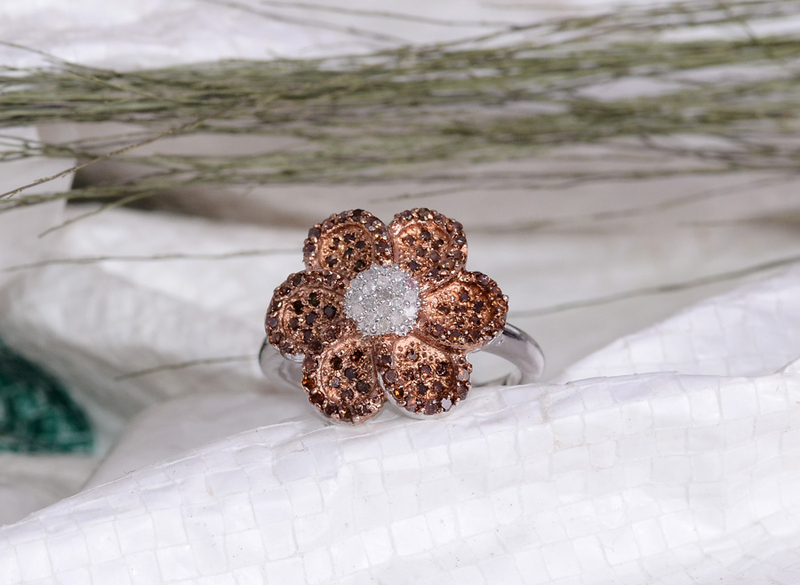 Shop LC always takes the highest precautions when sourcing stones, ensuring national and local laws are always observed, and resolutions such as the Kimberley Process. What Does Red Diamond Mean? The remarkable red diamond represents strength, confidence, and power. The fiery scintillation symbolizes passion and life. When describing Aaron’s Breastplate, the Holy Bible includes diamond as one of the twelve stones that represent the tribes of Israel. As to whether these were diamonds or not continues to be a matter of debate, due to different methods used in translating scripture. In Ancient India, where diamonds were well-known long before we knew them in the West, differently colored diamonds were assigned to different castes. Only warriors, known as Kshatriyas, could own red diamonds. Symbolizing the blood they were willing to shed in battle, lords employing Kshatriyas would sometimes pay their loyal servants with red diamonds. Ironically, for those who would take lives, the diamonds owned by Kshatriyas supposedly would also lengthen one’s lifespan and prevent the onset of aging. Is Red Diamond a Birthstone? Diamonds are the modern April birthstone, adopted in the early twentieth century. However, unlike other modern birthstones, diamonds have been used as an April birthstone as early as the 1600s. This makes diamonds one of the oldest continuously used birthstones. In addition to classic white diamonds, you’ll find fancy colored diamonds such as red diamonds at Shop LC. Ranks ten on the Mohs scale of hardness. Red diamonds at Shop LC are available in medium to dark red shades. Finished diamonds are sourced from worldwide locations. Red diamonds undergo irradiation to create color. Occasionally, high pressure high temperature (HPHT) treatments will be used to lighten and even out the color in stones.